Hello, everybody! I hope you're all having a wonderful holiday. I can't tell you how excited I am to finally be making a build thread! My name is Brendan. I'm 22 years old and I live alone with my cat, Raz. I've loved Star Wars forever and have always like dressing up in costumes. In high school, I got involved with some local Star Wars costume groups and met a lot of really great people. Unfortunately, they each came to an end because of leadership issues. Determined not to let yet another folded group mean the end of my access to Star Wars costume-y goodness, I finally decided to look into the 501st. Before this, I had always viewed the 501st and the Rebel Legion as an amazing, yet unattainable for me, calibre of cosplay. This totally changed when I found my way to whitearmor.net and saw how constructive, helpful and involved all these troopers are in elevating each other to success. Not only did it make the task seem much more approachable, but it cemented for me that this is a community I dearly want to be a part of. You guys ROCK! In August, I placed my order with Authentic Props. Besides being endorsed by countless troopers, a Canadian vendor was desirable for me because I live in Southwestern Ontario. Since then, I have had plenty of time to devour others' build threads and assemble all the tools and soft parts I would need. My boots came in from Imperial Boots, my blaster from Quest Design Canada, my neck seal from Geeky Pink, and other assorted goodies from Trooper Bay. I also ordered helmet electronics from Ukswrath on Etsy. I am super pleased with ALL of it and I highly recommend each of these vendors. With my shopping list completed, and my brain full of other troopers' great ideas, all I had left to do was wait for that beautiful big brown box—which arrived on Christmas Eve! Mark must have shipped "expedited parcel via reindeer". Ho ho ho! I decided to start with the helmet—I reckon that looking at it will serve as motivation as I work through the rest of the project! My first step was trimming and sending the back edges of the face. I know they won't be seen, but it gave me an opportunity to practice with the dremel. As others have suggested, tracing the guidelines with a pencil helped a great deal. Same thing with the back of the bucket. Then came the teeth. My oh my, this part stressed me out. I was afraid that, in my newbie hands, the drill bit was going to fly off in another direction and carve Joker-style scars up its face. I practiced on the scrap ABS first and, thankfully, I completed the dental work without injury (to myself, or to the mask). After drilling a hole in each indent, I used needle files to finish the shape. After that came the eyes, for which I first drilled, then cut with scissors, and then filed. I struggled with these a little. The OTTK's canon asymmetry will be an ongoing relief for me throughout this project, I think. Next I set about attaching mounting posts for the lenses. I used Chicago screws for this, super-gluing them directly to the inside of the mask (after sanding it a little). I'm aware that, lots of times, this isn't enough to keep them secured, so I used PlasticWeld to further secure them to the inside (pictures later on). I saw this on SlyFox470's thread. I cut the lens shapes from Trooper Bay's dark green lens, fit them to the screws one at a time, marked, and drilled. Here's a picture of the PlasticWeld securing the mounting posts. As also recommended in SlyFox's thread, I used some to reinforce the inside of the chin recesses since the plastic is a little thinner there. And that's where I've gotten so far! The PlasticWeld is currently curing. After that, I'll be coating the interior with PlastiDip. I am extremely eager to get your input and feedback as I work through this. As a first-time trooper, I'll need all the help I can get. Thanks everyone! And I totally agree with what you said about reading so much good advice that you can't remember who it came from -- same here! You seem to have a good handle on how to proceed, so my only advice at this point is to never be afraid to ask questions at any time. Thanks very much! :-) I definitely will be asking plenty of questions. For now, though, I've gotten a little further. The PlasticWeld cured, and I was able to mount the lenses successfully! Next step was PlastiDip. This cool idea of using bits of plastic bags to mask the teeth and eyes came from Scimitar's build thread! I bought the spray can version of PlastiDip, which ... lacked some precision, shall we say. I definitely could/should have taped up the outside of the mask first. Not to worry, though—a quick google search revealed that a small amount of WD40 on a cloth erases PlastiDip overspray like magic. All tidy! After this I wanted to do the mesh that fits behind the teeth. I didn't realize that AP's kit would ship with it provided, so (several months ago) I bought a window screen to cut up. On top of that, Trooper Bay's helmet kit included one as well, so now I had three options. I ended up really liking the look of layering the thin, grey one I bought over the thicker black one that came with the AP kit. If this is undesirable for any level of acceptance, please let me know! I still have the extra, normal black mesh and can swap it out without trouble. I sewed the two layers of mesh to some pieces of soft Velcro. I like the idea of being able to remove or replace the internal helmet components like the frown and lenses, so Velcro was the answer! Here's the hook Velcro attached to the inside of the mask. And the assembled face, from the inside and out! Painting day today! I figured it'd be easier to do the traps before the helmet is assembled. Unfortunately, I don't have any toothpicks on hand. I'll be picking some up later to tidy the edges once the enamel paint dries. As many have suggested, I first traced the guidelines with a pencil. Then I copied Scimitar's awesome idea of painting the black outlines first, and filling in the grey afterwards. This way you only have to worry about making one pretty edge at a time! Then, while my paintbrush was still black, I did the vocoder. Then came grey. I was really looking forward to painting the frown. On all the other build threads I've looked at, this step was always when the face came alive! After that, I filled in the traps and tears with grey. That's all the painting I could do for now. Once it's dry, I'll assemble the rest of the helmet and paint the ears, trap/tear lines and tube stripes. In the mean time, I drilled some holes in the chin recesses to install Ukswrath's hovi-tip speakers. 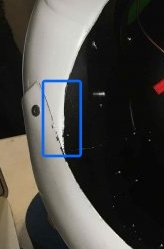 A heads up to anyone else who uses PlasticWeld to reinforce this part of the mask: at this point, I learned that the mic tips won't sit flush against the plastic (at least on an AP helmet), meaning that when I measured the threaded portion of the speakers to make sure they'd make it all the way through the PlasticWeld, my calculations were flawed. Thankfully, it ended up juuuust making it through for me, so all is good. Not really a biggie if they didn't—you'd just sand the PlasticWeld down—but better to be aware of ahead of time. Now to let the paint dry. I'll report back later! Nice work, to get your mic tips to both point straight you can use some pieces of rubber tube, cut one side on a slant and when fitted behind the mic tip you can rotate to get the desired angle then tighten. Matt, I will get that vocoder touched up once I get the paint back out for the ears! Thanks for pointing it out. And Q, thanks for the tip! That's a great idea. I'll have to go pick some up. In the mean time, I've riveted the assembly together. Woohoo! Although, I've run into my first problem. My head is too big! Is there any issue with simply dremeling the inside bottom lip of the bucket to open it up some more? If so, I may have to look at reconstructive surgery. Whatever it takes! Hahaha. Looking great so far, Brendan! Could you do us a favor and post up a complete side view of the helmet? The opening should be a bit larger which would give you the room to put it on,, but before breaking out the Dremel it looks as if you may have some wiggle room to open up the bottom a bit more (photo 1). This would mean removing the rivets, but could solve your problem without the cost of reconstructive surgery, lol. Also, at this point thinking about ear placement is key. Seeing a side view would help determine if the ears will be in the correct position, which should be at an angle and not vertical. As seen in the reference image below, the screws should line up with the angle of the rear trap. How much overlap on the sides do you currently have? Here's a side view and overlap shot of the left, and then of the right side of the helmet. And lastly here's a rough placement of the (veerrry untrimmed) ear. Something I didn't think to do at the beginning was trim anything off of the bottom lip of either the mask or the cap, so I may have missed a step there. In the last photo, the angle does seem to align, but the ear seems closer to the tear than in your reference photo. Maybe because it's untrimmed. Anyway, let me know what you think! Thanks again. Hi Brendan. Looking really good so far. As for the helmet opening - yeah, you could trim some off the bottom so your head fits in a bit better. Trimming the ears is a process - take little bits at a time - fitting and fine tuning as you go. By default, the dimples in the AP mold for the ear screws are pretty good but the alignment can be a little off from what Joseph mentioned above (the ears end up being very slightly too vertical compared to the edge of the trapezoid). You may need to locate the bottom screw a little further back than what the dimples suggest. That said, the difference is minimal. You could also adjust your frown to include the "phantom" tooth (see below). The depression that is not actually cut out but treated like a space. As for your mesh, it doesn't really matter - it is more for people not being able to see your face when they are close to you. Keep in mind that this is about the only air intake you have on your mask so you don't want to restrict air flow too much. Keep up the great work. Centurion in the making! I have an AP kit and had the helmet pre-trimmed. Where the holes were initially drilled was where I attached my ears. Afterwards, I was told on this forum about the angle being “off” and that my ears were too vertical. You’re early in the build yet where you can fix your angles. I had already finished my helmet and moved on and certainly don’t want to go back and change it. Let us know if you’re able to fit your head into the bucket after opening the bottom a bit and changing the angles of your ears. You certainly don’t need reconstructive surgery. Hi, everyone! Thanks so much for all of your feedback and suggestions. I finally had time to sit down and address this "helmet's too small" issue. Here goes! Firstly, I removed the old rivets and repositioned the mask further forward as Joseph suggested. I had to use bigger rivets than last time, since the holes expanded slightly while removing the first rivets. I don't think this is an issue, though, since they're covered up by the ears anyway. I countersunk the drill holes in the ears, as required for Centurion. Et voila! Here is the result. I am pleased with the seam coverage, but I was worried that the ears stuck out too far as a result. After looking at some reference photos, I don't think they're too far off. Let me know if you think it's problematic. Good news, though—my head now fits inside! I did still have to trim a little of the bottom inside lip, but not much. Huzzah! Next is installing Ukswrath's hearing assist so I can leave the ears screwed on for good, and then painting the ears, the lines on the traps/tears, and touching up the vocoder. Onwards! Whoops. Forgot to post photos of the ears from the back! Here we are. Nice work! Reconstructive surgery avoided! You have to trim alot more material around the ears, that raised lip all around shouldn't be visible at all. I took another pass at the ears. Thanks for the feedback! They definitely look better now. You can't argue with Mark the armour master himself, after all! There is a bit more of a gap under the ears now, but as I understand it that is canon and fine. The overall look is a huge step forward from how I had it before. Before putting the ears on, I drilled the holes on the back ear bump for the hearing assist, and installed the microphones under the ears using Sugru. You'll notice I had a little repair work to do from trimming and repositioning the ears; my new drill hole was rather close to an edge, so I used PlasticWeld to toughen it up (as seen in the photo above). Additionally, the bottom screw hole on the right ear fell right on top of the rivet that fastens the mask and cap, so I had to drill a new one in the ear. Not the ideal situation, but worth it for the new ears I think. I filled in the old hole with PlasticWeld and, when it dried, sanded and painted it gloss white (still have another coat to do). I'm hoping it's a tolerable blemish. Speaking of painting, I got to work on the remainder of the helmet. This included the stripes on the traps/tears, the ear bumps/rank stripe (outline for starters), the ear screws, fixing the vocoder and the tube stripes. Woohoo! I used the TrooperBay stencils for the tear, trap and tube stripes. I still have another coat to do on the tubes. Some of the ear bump lines are a little messy, but I'll tidy them up with a toothpick once they dry. I also started messing around with electronics inside, but I'll wait until the paint is dry before finishing that up and posting photos. Happy New Year everyone!! Hi, everyone! I hope you all had a safe and happy New Year! After a night of festivities it is back to business today! The stripe paint finished drying, and I removed the stencils. A while ago, I read an awesome idea about painting a coat of the surface colour (white for tubes, grey for traps/tears) over the stencils first to seal in the edges and prevent bleeding. Unfortunately ... I forgot about this idea until this morning, when I peeled the stencils off. Whoops! Not a huge deal! It just means some extra time tidying it up with a toothpick dipped in paint thinner. For the traps and tears, I went back with a small paintbrush and grey paint to correct the black stripe bleed. Well worth the effort. However, for anyone who may be reading this in preparation for their own build, learn from my oversight and put down that base-colour coat first. I'm sure it's a time-saver! In addition to the stripes, I also created the "phantom teeth" on my frown as Q suggested. To do so, I extended my frown and then used the toothpick to erase a small section near each end. Here's my result! 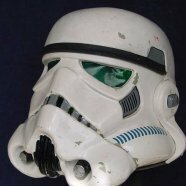 Finally, I attached the TrooperBay S-trim around the under-ridge of the helmet. I didn't end up having to cut mine down at all—by installing it slowly and sort of pushing back on it as I did so, it snuggly fit all the way around at met back under the chin. You can also see my electronics installed inside. Man, there is even less space in there than I thought there would be! Fitting it all inside was a challenging, but rewarding, puzzle. I have a little more tinkering to do, but I can put it on my head (sideways and twist). The installed electronics are Henry's helmet fans, Ukswrath's hovi-tip speakers, hearing assist and power amp, and an iComm. And—I think—that's a wrap on my bucket! It's been so much fun to work on so far. I'm very much looking forward to tackling the rest of the armour. As always, if you guys catch anything that needs fixing or improving I really appreciate your feedback. Nice work Brendan. The frown paint addition really adds to it. As you asked, I’ll just give a tiny bit of constructive feedback. If you’re aiming for the higher clearance levels at some stage, you might consider the vocoder paint (as Matt marked up a few posts back) and the tubestripes spacing. The other thing I’d mention is that the tube stripes are usually suggested at approx. a pencil width away from the cheeks. Yours are possibly a little further than that (pictured above in first pic). This wouldn’t be a clearance issue, just something that might be raised as a suggestion at a later date for the higher degrees of screen accuracy. Thanks for the feedback and encouragement, Dan! Your edits of my photos are really helpful. Whoops! You're totally right about the vocoder. I must have been looking at a wrong reference picture. I'll get that fixed up straight away. As for the tube stripes, I do see the difference there. I am shooting for Centurion - do you think mine will be an issue for level three clearance as they are now? If so, it's worth it to me to redo them, but if it isn't necessary I'd sooner move on to the other pieces. You want to bring those side sections up a little more. I saw that you extended the chin stripe to the back which was the other pic I posted- good work. Regarding your electronics- nice work getting it all to fit. I do suggest you wear the helmet for a little bit and see where your fans are circulating air. It looks like your placement of the fans are directed away from your lenses. Fan placement is obviously completely up to the individual, but a lot of folks have the fans aimed somewhat towards the lenses to prevent fogging. I also suggest running them with your mic on and the iComm. You’ll want to see if the mic pics up the blowing from the fans since you have both fairly close to the mic. Leaving that extra material and return edges makes the ears look a bit “chunky” in my opinion. I also haven’t seen anyone leave return edges on the ears. Mark of AP trimmed my ears for me and removed all the return edges.